Sito sviluppato intorno ad una data chiave nella storia italiana e portoghese: il 25 aprile. 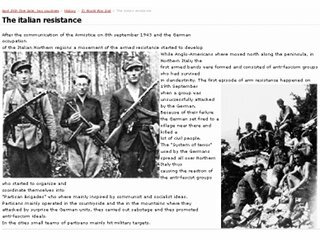 In Italia segna la fine della II guerra mondiale e la liberazione dall'occupazione nazi-fascista. Film: Trame e contesto di film su fascismo, Resistenza e Liberazione. Interviste: Testimonianze sul contesto storico. Questo sito è basato sulla tecnologia Dekiwiki che è una piattaforma collaborativa che permette agli utenti di partecipare allo sviluppo di siti web creando le pagine web on-line. A European Comenius Project developing around a key date in the history of Italy and Portugal: April 25th. In Italy it marks the end of World War II and the liberation from Nazi-Fascist occupation (25th April 1945) and in Portugal the end of a forty years long dictatorship (25th April 1974) . Films: Summary and contextual background of films set at the end of World War 2nd about Fascism, Resistance and Liberation. Interviews: Historical background and memories. This web site is based on a Dekiwiki technology. Dekiwiki is a collaborative platform which allows users to participate to the development of web-based applications by creating web pages using a common web browser. Dekiwiki consists in a front-end coded in PHP and an API coded in C# released under the open source licence GPL. This Dekiwiki implementation is executed on a Linux system equipped with Apache web server and Mono server both under GPL licence.